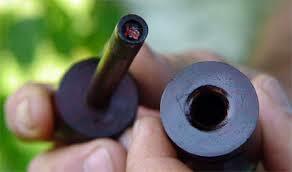 A fire piston or fire syringe is an old means from Southeast Asia to make fire. By rapid compression the air heats and ignites the tinder. This slam rod fire starter consists of a hollow cylinder (7.5 to 15 cm long) which is closed at one end. The diameter is about half a centimeter. A piston of the same diameter gets a seal (better: 2)(O - ring, greased rope) which ensures that no air can escape between the cylinder wall and the piston. The piston has a handle on the outside, to slam and on the other side, a small cavity to place some tinder. Ancient and modern versions exist in wood, bone, bamboo, or metal. Put tinder on the piston. Smash the piston powerful in the tube (possibly several times). Remove the piston with the tinder upside (otherwise is falls). Ready for use.